The SciTeeX Group has been active in the surface treatment area since 1992. The SciTeeX Co. is a leading machine manufacturer of global range. SciTeeX’s BLASTLUX Series blastrooms, RATIOJET wheelblast machines, and VENUS paint-and-dry booths have been granted many distinctions at International Events. This equipment has been operated by Customers in more than 34 countries of the world. SciTeeX machines are manufactured according to SciTeeX own and innovative designs. They are produced in SciTeeX’s Works, covering 30 000 m2 in total surface area with halls covering 7 500 m2 , equipped with a modern machine park. integration with peripheral equipment for realization of complex turnkey contracts, on an international scale. application of organic coatings by spraying and drying of liquid paints or by powdering and curing of powder paints. SciTeeX has developed the expertise in the large-size workpiece treatment area. Our fundamental asset is that we strive to attain the engineering excellence, to phase in the innovations, and to provide the high quality of service and machines. In its activity, the SciTeeX Group develops the ISO 9001 Quality Management System. SciTeeX employs 280 of staff members, 45 engineers and has over 20 of AutoCad's and 7 Inventor's licensed programs. SciTeeX’s modern production plant is situated 100 km south-east of Warsaw, Poland. Equipment: two laser cutting machines up to 4kW, automated storage of steel plate up to 90 tons, uncoiling machines up to 2mm, high-resolution plasma and oxy-cutting CNC up to 6m, three CNC press brakes up to 6m-300T, sheet metal bending machine, CNC tube bending machine, mechanical workshop, welding equipment, pneumatic blast machine, painting and drying booth. Pneumatic Blast Machine and Painting and Drying Booth used for productions are available as demo machines for tests by our customers. Standard Design Department suited to efficient and fast design of typical machines. R&D Department dedicated to tailor-made and innovative solutions. Our design departments work with modern and efficient CAD stations with AutoCAD Inventor / SolidWorks and other advanced technical software. We have at our disposal an extensive database with a library of standard drawings and unorthodox solutions. Our work practices are based on unrivalled expertise in machinery design, delivery and assembly. Our creative solutions are the optimal result of cooperation between our engineers and several research institutes. 2012 - SciTeeX opens a new branch : "SciTeeX France"
TÜV Certification of Declaration of conformity for Paint Booths VENUS and for SciTeeX production plant. 2011 – SciTeeX begins construction of a new Production and Demonstration Center of 3 000 m2 (commissioning forecasted 1st quarter 2012). 2008 –TÜV Certification for metal welding procedures. Implementation of ISO 14001:2004 for Environment and Management system. Implementation of OHSAS 18001:2007 for Occupational Health and Safety Management System. 2007 – ISO 9001:2000 Certification for design and manufacture of machines for surface finishing, delivery and service of corrosion protection equipment. 2002 – SciTeeX invests in a new production hall of 2200m2. Investment co-financed by EU funds. 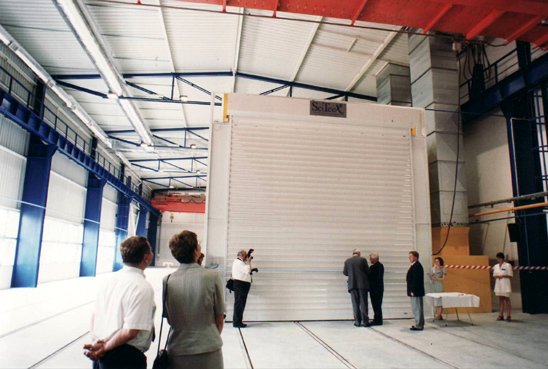 1993-1997– SciTeeX is involved in important industrial projects of surface treatment in Central Europe. 1992 – Establishment of SciTeeX as “Science and Technology Exchange”, technology transfer company.